This move fits in with our accelerated growth goal by providing high-quality document scanning, mailroom scanning and business process automation services backed by superior customer service to companies throughout New England. 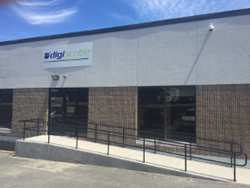 Digiscribe New England, provider of document scanning services, document management solutions and workflow automation software throughout New England, announces the move of their document conversion facility and administrative offices to a larger space in Norwood, located just outside of Boston, MA. The new facility allows the company to better serve their clients and meet the needs of their growing business. Digiscribe transforms the way companies, non-profits, and government agencies receive, process and manage their documents with business process automation. We offer a portfolio of services and software including mailroom scanning, workflow automation, cloud document management software and document scanning to help companies reduce costs while increasing efficiency, security and compliance. Our New York office is one of the first SOC 2 Type 2 document conversion centers in the tri-state area, and our New England office is a Massachusetts Privacy Law compliant facility. Both offer award winning technical support and customer service, more than 25 years of experience and a HIPPA compliance trained staff.